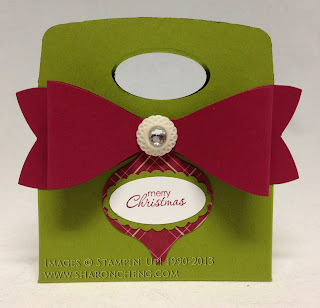 To celebrate the last day of their Holiday Sale tomorrow (December 2), Stampin' Up! is offering an extra 24-hour sale on six items including the envelope liner framelits which I used to make this purse. The Holiday Sale also includes the Holiday Ornament framelits which I used to make the embellishments on this purse and the Christmas Clothespin wreath. The ornament on this Christmas Clothespin Wreath was made using the Holiday Ornaments Framelits and the Ornament Keepsakes stamp set. Did you know that the Ornament Keepsakes stamp set (128051 $25.95) is still available? 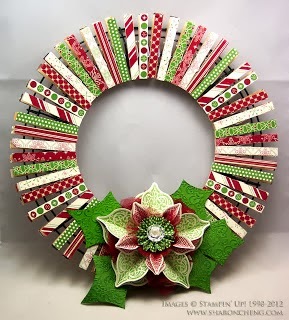 The Christmas Clothespin Wreath is one of my most popular posts on Pinterest. Here are all of the Holiday Sale items. Tomorrow you'll also see the 24-Hour Sale Items. In the meantime, if you're like me and want to see them ahead of time, here is the list. 24-Hour Sale, Monday, December 2nd Only!